November 21, 2017 By Chelsey 1 Comment This post may contain affiliate links. Read my disclosure policy here. Looking for an advent calendar for 2017 Light the World?? This is one of our favorite ways to celebrate the true meaning of Christmas! There are so many advent calendars out there. Some have candy or little gifts. Some are books or toys. But when our family take the time to do an advent I would love to think that each day we can grow closer together as a family and closer to the person we celebrate at Christmas. Jesus Christ has done so much for us and I know I feel closer to him by doing kind things He would do if he were here with us. This year I made the calendar directed to kids for the Light The World campaign. Children have natural gifts of patience, kindness, forgiveness, compassion and love. Teaching them that they can use these natural abilities to lift and love everyone is a beautiful thing. It can open up a whole world of opportunities for them. They will find a joy that can not me felt any other way than by serving and loving those around you. Together as a family you will truly Light the World and fill it with goodness. 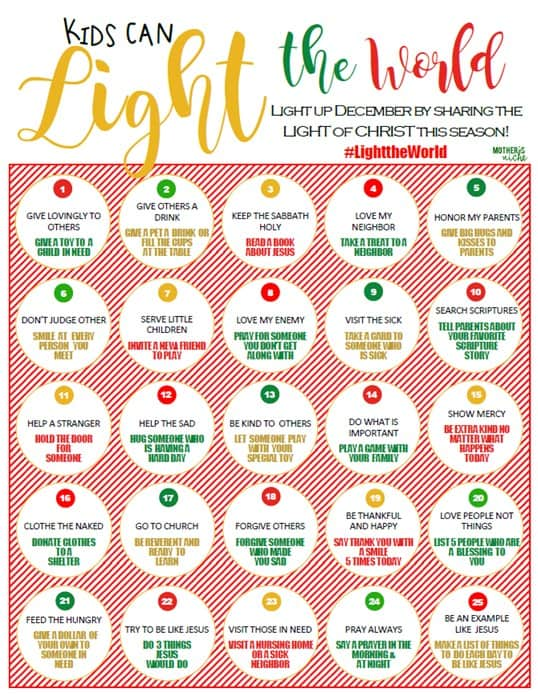 If you are looking for great ideas and printables for each of the themed days, see our #LighttheWorld ideas page. One of our neighborhood’s favorite traditions now is hosting a Neighborhood Care & Share. Each day of the month of December has an activity that kids can do by themselves or with a little help from an adult. As you are excited and praise them for the Christlike example they are being when they go these kid acts. It will become contagious and they can’t wait for the activity for the next day. Version 1: Download and Print this Calendar and use it as it is and check it off, fill it in, or mark with a star stickers as that daily activity has been done. Leaving the activities revealed gives mom and dad a heads up for what to expect the next day. That is handy for a planner like me, for sure! 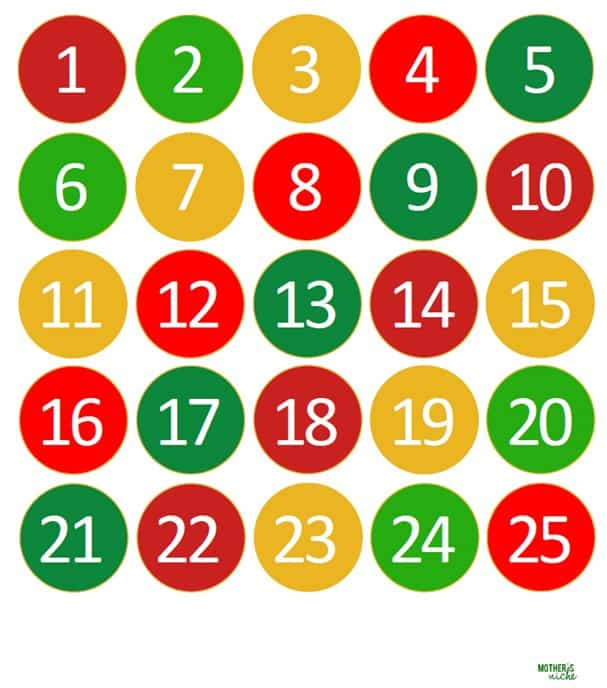 Version 2: Download and Print this Calendar and the Numbers download. Then leave this sheet as is and cut the solid numbers out of page to to cover the activity to make each day a surprise. I use poster puddy or if laminated, you can use tape If you as a parent want to have a heads up on the activity for the next day, feel free to peek or print a second copy for you of the the daily schedule. 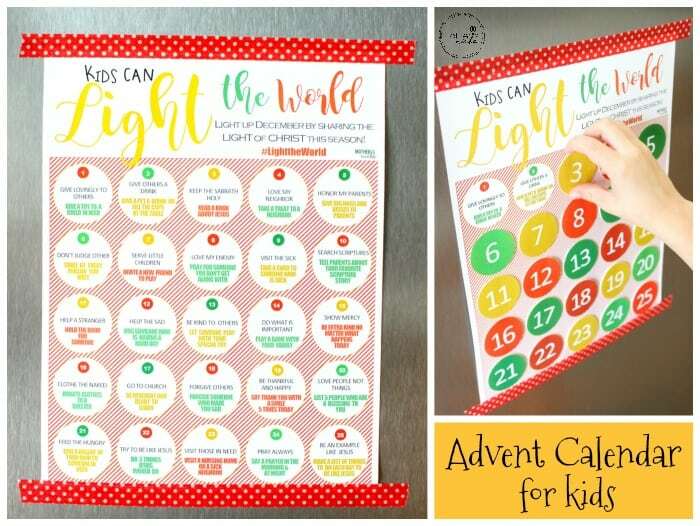 Check out last years Family Light the World Advent Calendar Printable here! Also, Here are lots of other ways to get you ready for Christmas! Love them all! Thanks for including mine!